CatholicTV To Air New Episodes of "The Future Depends on Love"
Starting in March, CatholicTV will air new episodes of the show on marriage called “The Future Depends on Love.” The new episodes will feature a variety of guests. Here is a list of the guests and themes of the new episodes which will start in March. 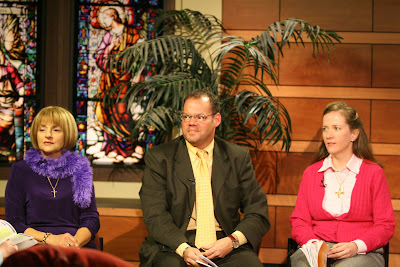 The show is hosted by Dr. David and Dr. Angela Franks who are both professors at St. John’s Seminary in Brighton, MA. With divorce statistics higher than ever and teenage pregnancy rates up for the first time in 15 years (source:CNN.COM), Catholic parents and young people are concerned about the messages that Catholics receive from the media and their friends regarding sexuality and marriage. In response, the Catholic bishops of Massachusetts, being well aware of the rise in divorce, sexual immorality, adultery, and abortion began a new initiative from which this television show sprung forth. The show is viewable each week on Monday-5:30P.M., Tuesday-1:30P.M., Wednesday-3:30A.M., Thursday 11:30A.M., 8:00P.M., and Sunday-3:30P.M. 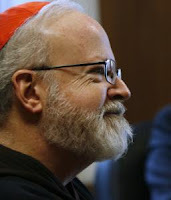 On Monday, February 23rd, the Director of Catholic TV, Father Robert Reed, will appear on The Catholic Channel show "The Catholics Next Door" Jennifer and Greg Willits are the hosts of the show. Also, they are the producers of That Catholic Show which airs on CatholicTV. CatholicTV will begin airing a new series entitled “ARISE Together in Christ” (ARISE) starting March 2nd. 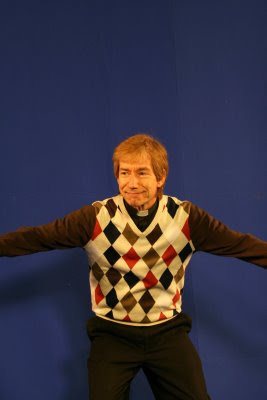 The show is based on a Catholic program of the same name created by Renew International. The show features ordinary Catholics discussing their faith and making a commitment each week to put their faith into action. ARISE is a parish program which consists of weekly meetings of small groups of parishioners (3-8 normally) to discuss, and grow in their faith. Each meeting is centered around a bible passage and a theme. Every week, participants make plans to put what they have learned in their meeting into action. The television program is a look into these meetings that take place amongst ARISE members. Although normal ARISE meetings last 90 minutes, the television show on CatholicTV compacts ARISE meetings into a TV-friendly 28 minutes. Each episode consists of a reading from the Bible, a very brief talk about the reading by a clergy member, and finally, the discussion featuring the small group. During this discussion, the group members talk about what the Bible reading means to them. The last portion is called “Invitation to Act” where small group members talk about what action they will take during the upcoming week to live out what they learned from the reading and discussion. For instance, session 4 for the 2009 Lenten season has the theme “Darkness to Light”. It revolves around the Gospel of John Chapter 3:1-21. After reading the passage and discussing it, participants are then asked to think of a difficult situation in the family, workplace, parish, or neighborhood and to commit to an action that will help to improve the situation. The following week, members discuss what actions they took and what the results were. The show will air each week at these times (EST) Monday 12:30PM; Friday 11:30PM, and Saturday 10:30AM. As I get older my life continues to change. I find myself reminiscing about the past and those who have touched my life in a significant way. My parents, sisters, grade school friends, college friends, grandparents and those you meet on your life journey. As I think back there are times that I smile remembering so many wonderful experiences. Those special moments that at the time may have seemed insignificant but to now bring such joy. But sometimes there is a sadness thinking of the past because some of those people are no longer in my life due to different circumstances. Also I am saddened by not being able to physically do what I could do when I was twenty. I would love to go back to the days I had in college and again share that bond I had every day with my friends who were my brothers. I miss the way that my grandmothers always made me feel special. As if I was the only one in the room. I miss my sister, Father Frank, and Jack Lawless, all of whom made me strive to be a better person. I miss those milestones in my children’s lives. Their first step, going to school, them falling to sleep in my arms. I sometimes wish I could stop time and nothing would change. Yet, if that were to of happen I would not have met my beautiful wife and had three children who I love with all my heart. I would not have seen the Red Sox win the World Series! God has a plan for each of us. I am richer for having known all those people and I thank God for all he has done. I do not know what the future holds but I welcome it and look back lovingly on the past. Starting in March, Father Robert Barron will be featured in a new series on CatholicTV entitled “Word on Fire”. 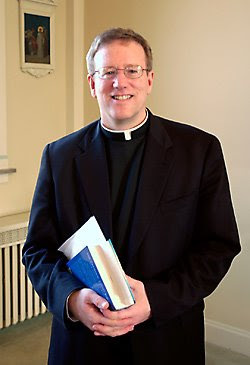 Fr Barron is a renowned speaker and theologian. Father Robert Barron is a Catholic evangelist. He is a sought-after speaker on the spiritual life-from prestigious universities to YouTube to national conferences and private retreats. His website launched in 1999 draws over 300,000 visitors a year from every continent. Fr. Barron posts weekly video clips, commentaries and radio sermons and offers an audio archive of over 300 homilies. Father Barron has been featured on Relevant Radio, and the “Busted Halo Show” on Sirius satellite radio. He is an award-winning author and is currently working on The Catholicism Project will be a monumental, documentary series on the teachings of the Catholic faith. Father Barron’s new short program format series on CatholicTV features Father Barron discussing such topics as the 7 deadly sins, 7 lively virtues, and following the call of Christ, among others. Father Barron will discuss questions about the Catholic faith as well. For viewers who want to grow in holiness, Father Robert Barron will also talk about answering God’s call to be saints. The teachings will include practical, real-world applications and lessons. Starting in March, the show will air each week at the following times (EST) Mon. 9:30 p.m., Tue. 9 a.m., Weds.11:30 a.m., Sat. 1:30 p.m., and Sun. 1 a.m. 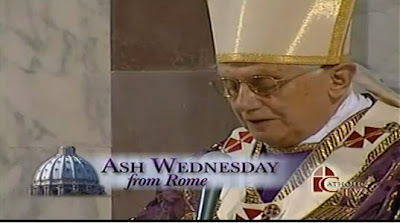 Starting in March, “Word on Fire” will be viewable on CatholicTV where available and is also streamed live (simultaneously) at http://www.catholictv.com/. 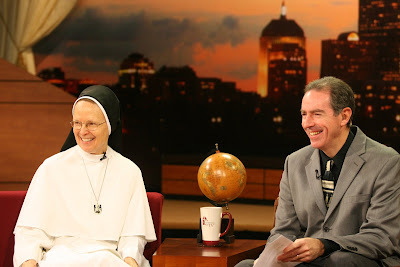 Brenda Sharman will be featured on the CatholicTV talk show “This is the Day” on Friday, February 20th. Brenda Sharman is the National Director of Pure Fashion. Pure Fashion is an organization which works with local leaders, clergy, and lay people to promote the virtue of modesty, protect and preserve purity, and foster an awareness of the dignity of the human person. Mrs. Sharman was the 1990 Miss Georgia USA and a professional model and spokesperson. Pure Fashion began seven years ago when a group of Catholic mothers, disappointed by the clothing choices offered to young people, began discussing ways to change the culture, “one outfit at a time.” Today, Pure Fashion has grown to include programs across the country, proving to teenagers that they can be modest in their clothing while still being stylish and fun. Mrs. Sharman will discuss modesty and Pure Fashion on the show. Also on the show will be Sister Joseph Andrew. Sister Joseph is a nun from The Dominican Sisters of Mary, Mother of the Eucharist (Dominican Sisters MME). The Dominican Sisters MME Order was founded in 1997 with four sisters. Their numbers have ballooned to over 80 sisters and their average age is a very young 28. The average age of women who enter is 21. Sisters have joined from all across America and even Europe and the Caribbean. The Dominican Sisters MME have recently experienced an explosion in their vocations. Their upcoming discernment retreat for example, will have over 100 attendees. Sister Joseph will discuss vocations and the spirituality of the order on “This is the Day”. A number of years ago I learned about a condition, a somewhat common condition called macular degeneration. I learned about it because my dad had it. Macular degeneration is a condition usually of older adults which results in a loss of vision in the center of the visual field (the Macular) because of damage to the retina. It is a major cause of blindness in those over 50 years. I recall that it made it increasingly difficult for my father to read or recognize faces, although he had enough peripheral vision to allow him to carry on fairly well. I recall him often saying something like: those people over there look like walking trees. Sound familiar? Maybe you struggle with this same condition or perhaps one of your parents or a grandparent? Maybe this was the very problem that afflicted the man from Bethsaida? Now, I am not Dr Reed trying to diagnose the medical issues of people two thousand years ago. I am Fr Reed trying, like you, to make my way through this life with the great help of my Faith. And you know, it takes a sense of bravery to live this life. We are all presented challenges along the way, but my observation has been that as one gets older, those challenges and obstacles mount...especially in the realm of the physical. These eyes, these bodies of ours are fragile and not meant to last forever. Despite all the advances in medical science, there are some problems doctors just can’t fix. Yes, miracles do happen, but not for all. I am certain there were others in Bethsaida who were not physically touched by Jesus. But He came and walked among them! Our coming together in prayer here today is our daily chance to focus on what is lasting and most important in life…and that is: our relationships. First of all our deep connection with the Lord Jesus, the Divine Physician, the healer of both body and spirit. We are united in Him AND, we are deeply connected to one another in the mystery of the Church. Granted, this body, this ark we have been given to navigate life is not made to last forever. But we are! Think of it: you are meant for eternity, you and I are meant for God. We will, as St Augustine powerfully reflected, we will be restless until we rest in Him. Allow the Lord Jesus, who does indeed live among us, allow the Lord to touch you today. Know that you are loved beyond belief, that no ache or worry or thought is unknown to Him. So...once again, we come into the presence of God, with all of our physical struggles and our sinfulness. We park our arks and discover that we are, if you will, we are all in the same boat. Thank God for this boat, the Church, that sustains us and heals us and carries us toward the fullness of life. 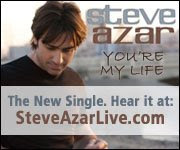 Steve Azar who was our first phone in guest for This is the Day has released a new CD and the single, You're My Life is shooting up the charts! Check it out! Jonathan shared a beatuiful picture of his daughters with their new friends, Miley the Bear and Ashley the Dog!